ACT Two of the Extreme Footy Series got underway at Sutton Sailing Club with nine skippers signing on at registration and having their diminutive footy yachts checked and measured. The hard edges and the reservoir dam at the end tend to make for choppy waters at Sutton, for the Footy it can sometimes seem like you are sailing in the south seas rather than Birmingham., this can make it a tricky venue for Footy skippers and I believe goes some way to explaining the preference for Una rigs amongst the local skippers. The wind was a South Westerly from off the shore, it slowly built and cranked around to more down the lake during the day, the early wind was a bit fluky with some holes it in and the assembled skippers were switching rigs quite regularly to find the best ones for the conditions. The initial course was set with a wide starting gate, a port rounding around the up wind mark (1) to a spreader (2), then back down wind to a narrow gate (3&4). Back up and down to the upwind marks firstly to 1 then the gate 3&4 back to 2 all to port and then a final starboard rounding of a mark (green) and a short final leg close to the shore which proved a game changer on more than one occasion. The only course changes were to shift the starting gate and the downwind gate further inshore as the wind shifted around. Writing this description of the course they always sound more complicated than they actually are when you are sailing them. The racing got underway at around 9.40 am with a practice race, which immediately sorted out a couple of teething problems with Brian Hawkins 1299, after a lot of changing of components over the first four races it turned out to be batteries. The early bias of the start line was with the port starters, however only Mike Ewart (36, ICE) and Peter Shepherd (65, Fat Boy) appeared to recognise this and it took a few races for the rest of the fleet to catch on. There was strong pressure further out however in the morning races rig choice was always a compromise as the inshore pressure was always less and the final two legs tracked this light pressure area. The results appear to show these two skippers running away with the event however this was far from the case, Peter Jackson (30, Fat Boy Slim) with his new heavier keel bulb appeared to to be coming back up the leader board mixing it with the top two on numerous occasions, he was the only other skipper to win, managing to take two race victories. Behind these three there was a great battle between local skippers Graham Tite (Sui4, Slim) and Mark Unitt (18, 12”Slim) the change of scoring system helping these two keep in touch with each other as they checked the leader board to see how many points they had accumulated so far, their battle went to the final double points race, both going into it on 77 points. I was most impressed with the build quality and performance of Mark's 12” Slim, which was a birthday present from his father Roger. 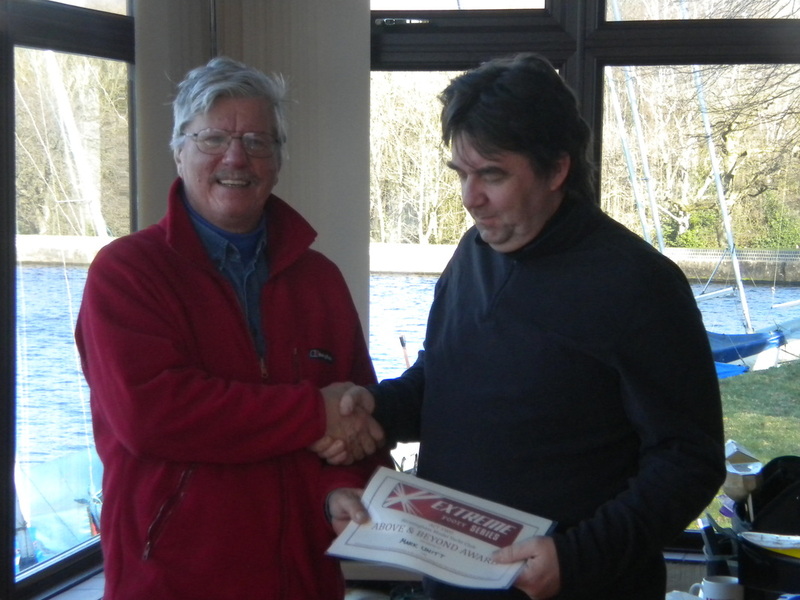 There was more than one race where he featured at the front mixing it with the leaders, and for this and daring to be different with his boat design we awarded him the Extreme Footy Series, Act 2 - Above & Beyond Award. Another local skipper John Burgoine (40, 1299) borrowed Graham Tite's “Quackers” a boat that has been around a long time now, it wasn't entirely to his taste however he did manage to have a couple of moments in the sun, leading the fleet out in a couple of races even if he fell back through the fleet as they progressed, the one time this didn't happen he took 2nd place in race 12, inspired by the close racing and fun nature of the footy events he is now on the hunt for his own boat, anyone got anything to offer? Geoff Raygada (41, Fat Boy Slim) just like the rest of us before him, struggled with the chop on the water, it being his first sailing experience at Sutton, with the opportunity to compare his boat with the 65 Fat Boy after the journey home, and a few tweaks already made I am sure he will be back and firing on all cylinders for the next event. David Wilkinson (46, Breithorn) this design from Switzerland being one of the lightest yachts around at only 330g and light on the keel weight suffered with the differing wind conditions and he just didn't seem to be able to get going, eventually succumbing to a sail servo failure in race ten, that having been said I am sure with a steady breeze and calmer conditions it could be made to go very well. Thanks must go to the assembled skippers who on the whole behave impeccably at these events, doing the required turns for penalties without question and with good humour which enables us as organisers to enjoy the event as well, I must also thank Robin Webb for doing the score card and start line duties with his usual enthusiasm, once again he commented that he thoroughly enjoyed watching the tactical battles taking place throughout the fleet, if we keep this up we might turn Footy racing into a spectator sport! 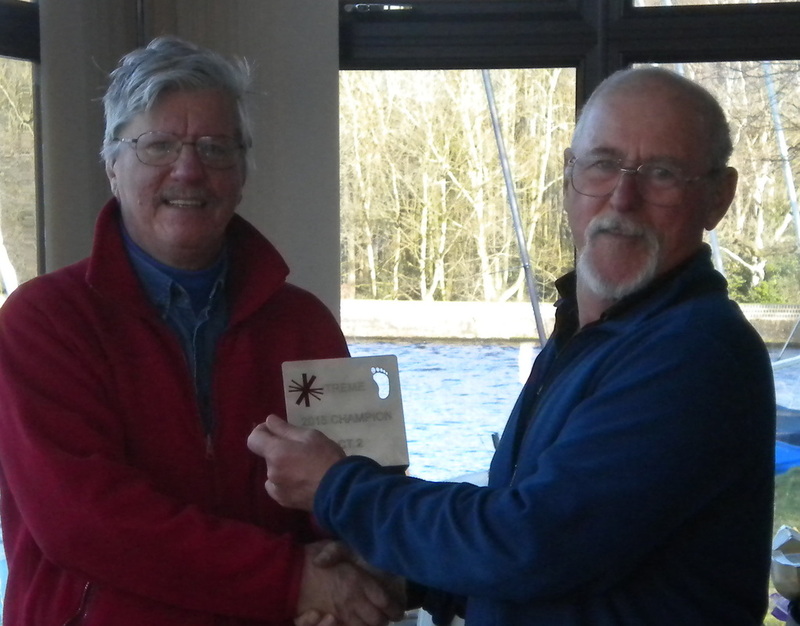 Act 2 Winner Mike Ewart recieves his prize from Graham Tite, Birmingham Model Yacht Club Commodore. The next Footy event is the Mad March Hare at Cotswold on March 15th, and the next Extreme Footy Series event is once more in the West Midlands at Sandwell Model Boat Club on April 4th, hopefully some of those who raced this time will want to repeat the experience.